I feel like I’m constantly trying to learn how to simplify my life. Are you tired of constantly being stressed out and overwhelmed? I’m right there with you. My husband needs help, my kids need help, my house is a wreck (even though I cleaned it yesterday), I don’t have a clue what to make for dinner. I could go on and on. It is frustrating because none of the individual stressors are crazy and completely overwhelming, but when you put them all together I can’t help but panic at times looking at my to-do list. It is just so easy to get overwhelmed and shut down rather than find easy ways to simplify my life and home. 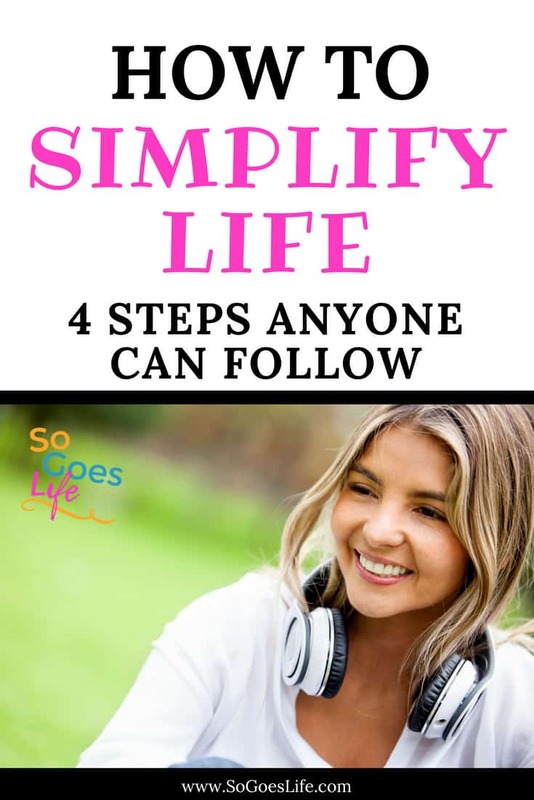 I’ve finally begun learning how to simplify life and have developed 4 steps that work for me. Write a list of everything that causes you stress. The first step in the simplification process is to write a list of everything that is causing you to stress and preventing you from simplifying your life. I know it sounds kind of counterproductive, since if you write everything down, then you have to face everything. Trust me though, it helps. When I start to feel the overwhelm coming on I get a few sheets of paper (one is never enough) and start writing. Write down everything that is causing you stress and be specific. When my house is causing me stress I write down stuff that needs to be done in every room in my house. If it is kids, family or extended family, write it down. Again, you need to be specific. Even if there really isn’t anything you can do about the stress in your life, write it down. Once you are done you should have a fairly extensive list – one that you will probably continue to add to over the next couple of days. On a side note, I recommend putting this list somewhere safe. Let’s be blunt, you probably don’t want others to read this list since it is essentially a mini-venting session. This is where I start the simplification process in my home. Once I have everything written down, I start looking through my list for the simple things that I can do right now that will help decrease my stress load. This is the simple stuff, like doing the dishes. Just having a clean kitchen can completely change my outlook. On my first run through, I’m looking for little 5-15 minutes fixes. Simple things I can do right at that moment that will take things off my list. I know it sounds so simple, but it really does help. 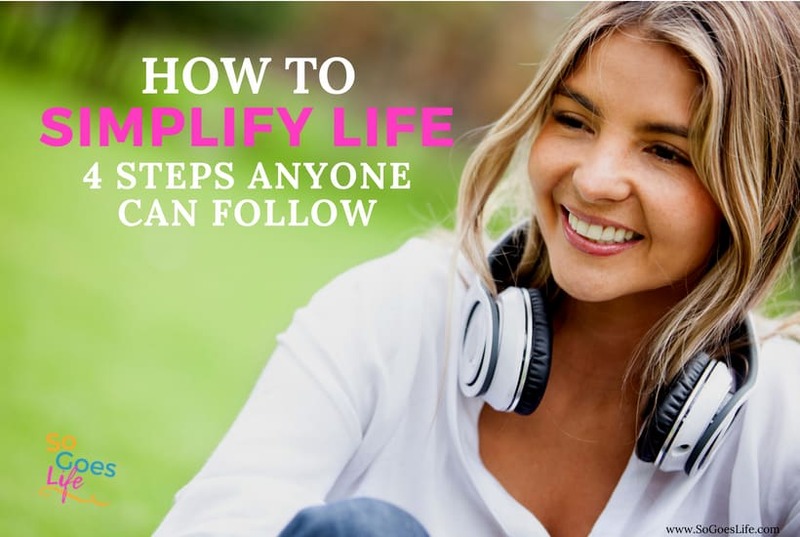 Not all life simplification steps can be done in 15 minutes chunks. However, some simple items can be eliminated in the future by thinking outside the box. For example, a low hanging fruit for me is meal planning. Cooking and feeding people, completely stresses me out. If I know what I’m making and have the ingredients I’m completely fine, but the act of figuring a meal out and getting the ingredients stress me out like no other. To resolve this I’ve started meal planning. I use $5 Meal Plans and seriously love them! Meal Planning has been life-changing for me. Just having a list of food ideas and their corresponding ingredients makes organizing my week so much easier. I’ve also started to use Walmart Grocery pickup (use this link for $10 of your first order and I’ll get $10 off my next order – win/win). The Walmart grocery pick up is free and ordering takes me less than 5 minutes. Since switching to Walmart Grocery pick up, I’ve saved tons of time and more importantly a whole lot of money. I also order a lot of my pantry type groceries and general household supplies through Amazon. Their pantry and subscription services are awesome for staple products you use regularly. I know that they have a grocery service as well, but haven’t gotten up the nerve to try it yet. Although it took a little bit of time to start the whole meal planning process, once I got the bugs ironed out of my system, it has really helped me simplify my life. As you are reviewing your list of stressors look for similar areas of your life that you can simplify. The goal of this step is to find the little simplification steps that will have the most bang for their buck. I’ve found that by resolving some of the smaller issues, it frees enough time for me to tackle the bigger issues without as much stress. Unfortunately, getting rid of the low hanging fruit although awesome, rarely solves the question of how to simplify life. The larger stress items are going to be individual to you based on your family situation. Most of these issues are tied to either financial problems or over scheduling/too many responsibilities. I’ve noticed with many of the readers I talk too, the number one cause of stress in their life is tied to money problems. This is a total generality, but many of them have enormous amounts of debt and yet are still trying to live a life of freedom and honestly way too much consumer spending. #Truthbomb – If you are in debt and mismanaging your money, your life is full of stress! The only way to change this is to get yourself on a written budget and get out of debt. I’ve written a ton on this on my other blog, so check out these posts, to help you get your financial life in order. The other major cause of stress is caused by overscheduling or taking on too many commitments. Learning to say no is one of the most important steps you can take as you begin simplifying your life. I remember when my step-daughters where in High School. My husband and I were both working full time, the kids had all kinds of school and sports-related activities. It was seriously crazy. There were days when we would leave the house at 6:00 AM and wouldn’t get home until 9:00. Everyone had conflicting schedules and at times I wondered if we would ever see each other during the day. Our crazy schedules left literally no free time for anyone. The house was perpetually messy and all of us felt completely overwhelmed with all of our work, family, church, financial & friend obligations. I’m sure most of you can relate! We got through those years, but looking back, I would totally change things. We completely overbooked ourselves and our kids and none of us benefited from the experience. The goal in these situations is to look at your life carefully and see what needs to be simplified and/or eliminated. One of the biggest problems I see is that most of the stuff on the simplification list are great things, that bring us joy. I read a talk years ago that talked about the concept of good, better & best. The whole premise of this talk was simplifying your life based on the best things, not just the good and better things in life. It is really easy to keep the good and better things in our lives even though their inclusion is actually causing us additional stress. Ultimately we don’t have time for everything in life, so we want to focus on the best things in life rather than just the good things. I’m not here to tell you what things you need to cut out, but I’m here with a gentle reminder that you can’t do it all. One of the reasons I recommended writing down the list, is to have you take a hard look at what is causing you stress. Do you really need all of the stuff you have listed in your life? Are all the extra obligations you’ve taken on really things that you want to accept reasonability for? Now, let’s also be honest with ourselves and realize that unfortunately, we can’t get rid of all of the stress in our lives. As parents, sometimes we have to accept that we have to take care of our kids. However, do our kids really need that over the top birthday party? Do our kids really need music, sports, and tutoring lessons every week? Again, those are all important things but do they need everything? Maybe what they really need is some time to just be a kid. I struggle to let go of some of these things because they are important, but I’ve learned to prioritize the best things in an effort to simplify my life. Sometimes it is okay to let things go! Lay out a plan of attack and follow it. This is the most important step and the one I encourage you to really think about. You can attempt to simplify your life over and over again, but unless you set specific measurable goals and work towards accomplishing them, you won’t be successful at changing your life. Look at your list and try and pick 1-3 items that are completely overwhelming you. Most likely they are major issues that are going to take a bit more planning and thought to resolve. For example, if a bit chunk of your stress is caused by your need to work and you want to be home with your kids, you need a complete plan that will enable to you get out of debt, live on a single income or find a side hustle you can do from home. Issues like this take a lot of planning to resolve. Here is the deal, if you have a major stressor in your life unless you start making a plan to resolve the issue, it is going to continue to be an issue 3, 6 & 10 years down the road. Most major stress issues don’t resolve themselves. It is up to you to find a solution that will help you simplify your life. Once you have picked your 1-3 items, it is time to brainstorm solutions. Talk through the issues with your spouse or a friend. Write down workable solutions and then set goals. Unless you actually do this step you’ll constantly fail in your efforts to simplify your life. I wasn’t successful at simplifying my life until I finally got tired of being tired. I still have a lot of simplifying to do, but I’m slowly working my way through these steps over and over again. Every time I think I’ve got my life simplified, I go and complicate things again. I’m definitely learning this one through trial and error. Here is the deal though, every time I go through these steps my life gets a bit more manageable and things get just a little bit easier. Keep working through the steps and I can guarantee that eventually, you’ll find the simple life you’ve been dreaming off.